'We have never before seen an Indian prime minister's visit to the United States so heavily business-oriented and so packed with meetings with the US business community.' Aziz Haniffa/Rediff.com reports from Washington, DC. New York Mayor Bill de Blasio will be the first elected American official to meet with Prime Minister Narendra Modi when he arrives in the United States on September 26 afternoon to attend the United Nations General Assembly session. After two-and-a-half days in New York, Modi will fly down to Washington, DC, for his summit with President Barack Obama at the White House. After India's Ambassador to the US Dr Subrahmanyam Jaishankar and India's Permanent Representative to the United Nations Asoke Kumar Mukerji receive Modi at the John F Kennedy International Airport, and he is whisked away by motorcade to the New York Palace Hotel in Manhattan, Mayor Blasio will pay a welcoming courtesy call on him. That evening, Nobel Laureate Harold Eliot Varmus, director, National Cancer Institute, who won the Nobel Prize for Medicine along with J Michael Bishop in 1989 for their discovery of the cellular origin of retroviral oncogenes, will call on the prime minister. September 27 morning, Modi will visit Ground Zero and the 9/11 Memorial Museum recently opened to honor the victims of the worst terrorist attacks in the history of the United States. 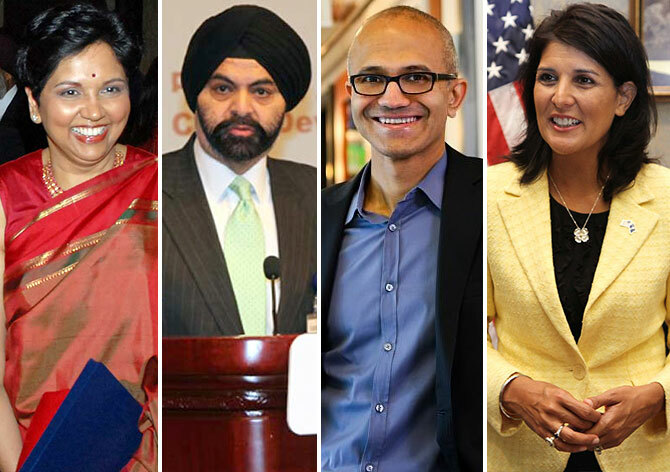 Image, above: Among those likely to meet Prime Minister Modi during his US visit: PepsiCo Chairman Indra Nooyi, Mastercard CEO, Ajay Banga, Microsoft CEO Satya Nadella and South Carolina Nikki Haley. He will then proceed to the United Nations to deliver his remarks to the United Nations General Assembly. After that he will engage in bilateral meetings, including with Sri Lankan President Mahinda Rajapakse, Bangladesh Prime Minister Sheikh Hasina, and possibly Israeli Prime Minister Benjamin Netanyahu, but is unlikely to meet Pakistani Prime Minister Nawaz Sharif. In the afternoon, former New York mayor Michael Bloomberg will call on him at his hotel suite. Discussions are likely to focus on one of the billionaire Bloomberg's pet project of 'Smart cities,' which Modi is very much interested in and wants to replicate in India. The prime minister will then proceed around 6 pm to the Great Lawn in Central Park to participate in the Global Citizen Festival where he will speak along with several other heads of State. A star-studded line up of musicians and celebrity hosts will also be present, including Hugh Jackman, Jessica Alba, Jay Z, No Doubt, Carrie Underwood, The Roots and Tiesto. The event will call for accelerated progress in poverty alleviation, health care, and sanitation for millions around the world. Modi, who is slated to speak for a few minutes, apparently had wanted very much to be at this event because a lot of themes being propounded at the Global Citizen Festival were close to his heart in an sync with his own agenda that he had articulated in his Independence Day speech. After returning to his hotel, Prime Minister Modi will meet with a group of prominent Indian Americans -- many of whom have been his ardent supporters over the years -- led by his close friend Dr Bharat Barai, the point man behind the Madison Square Garden community reception in his honor the next day. September 28 morning, the first woman Governor of South Carolina, Nimrata 'Nikki' Randhawa Haley, will call on Prime Minister Modi and once again the discussion will centre around Indian investments in South Carolina and reciprocal ventures in India. No meeting has yet been scheduled with the first Indian-American Governor, Piyush 'Bobby' Jindal of Louisiana, who has indicated an interest to run for President in 2016, who apparently had shown no enthusiasm or inclination -- like Haley did -- to meet with Modi. The prime minister will then make his way to Madison Square Garden for the community extravaganza in his honor where he is expected to address about 18,000 people from across the country for nearly an hour. His speech will also be beamed at Times Square and Web cast around the world. At 6 pm September 28, Prime Minister Modi will attend a community reception and dinner hosted in his honor at the Taj-owned The Pierre hotel by Ambassador Jaishankar for more than 300 guests, including several US lawmakers, including the only serving Indian-American in the US Congress Dr Amerish 'Ami' Bera, and Tulsi Gabbard, the first and only Hindu American in the US House of Representatives. September 29 will begin with a breakfast meeting with a group of eminent CEOs from Fortune 500 companies, which is likely to include Satya Nadella of Microsoft, Indra Nooyi of PepsiCo, and Ajay Banga of MasterCard. This will be followed by a meeting with former President Bill Clinton and Hillary Clinton -- the most talked about presidential candidate for 2016 -- after which Modi will deliver a speech at the Council on Foreign Relations. There, he will be introduced by CFR President Richard Haass, who has written extensively on India and South Asia and was a senior State Department and National Security Council official. Around 2 pm, Air India One will make the one-hour flight to the Andrews Air Force Base in Maryland. After being received by a senior State Department protocol officer, he will come into DC by motorcade and be put up at Blair House where visiting foreign leaders to Washington, DC are housed. Modi will then be hosted to a private dinner at the White House by President Obama and First Lady Michelle Obama. September 30, the prime minister will make quick visits to the Lincoln Memorial and the recently constructed Reverend Martin Luther King Memorial, and then travel down Embassy Row on Massachusetts Avenue, Northwest to the Mahatma Gandhi statue directly opposite the Indian embassy. He will then meet with embassy officials, who have been preparing assiduously over the past few weeks to coordinate the visit and also spruce up the embassy, which has also put up in the lobby for the first a huge portrait of Swami Vivekananda, one of Modi's heroes. The prime minister will then leave for the White House for the formal summit with President Obama in the East Room following a photo-op and brief remarks by both leaders in the Oval Office. After this meeting that is expected to end a little after noon, Modi will go to the State Department for a luncheon hosted by Vice President Joe Biden and Secretary of State John F Kerry. Besides senior administration officials, some leading US Senators are also expected to be in attendance at this lunch. After the luncheon expected to end a little after 2 pm, the prime minister and his entourage will go up on Capitol Hill for a tea hosted by House Speaker John Boehner in his office along with the House Congressional leadership. Modi will then return to downtown DC for his final event in the US, to the US Chamber of Commerce Building on H Street NW, where the US-India Business Council, chaired by Banga, will welcome him. Ambassador Susan Esserman, former deputy US trade representative in the Clinton administration, and a senior USIBC board member, said, "We have never before seen an Indian prime minister's visit to the United States so heavily business-oriented and so packed with meetings with the US business community."